Producer Alan Abrahams is already onto his fourth album, having already graced the rosters of Background Recordings and scape with full-length releases. This latest body of work seems to be the fruit of a great deal of collaboration, and no short supply of vocals, though not always in a conventional sense. Voices are mangled and dissolved into the rest of the production on tracks like 'Shifting Sunlight' (which features Tor of Deadcombo), and similarly 'Locate' uses its female vocal as another percussive element, integrating nicely into the 4/4 network of hypermodern techno contortions. 'Arrabida' is an especially successful example of one of the slower tracks on the album, based around some overheated beats, just on the cusp of outright distortion, while elsewhere you'll find variants on an electropop theme, taking a Depeche Mode-like approach to more conventionally song-like works such as 'Albatros' and 'Take Action'. 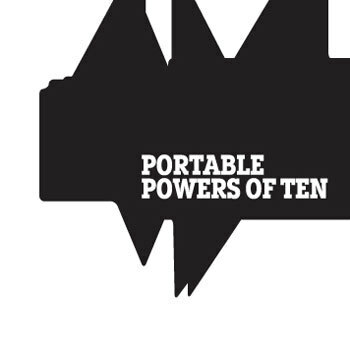 Software nerds are bound to find plenty to keep them engrossed in Powers Of Ten, but beyond the production gloss there's plenty of pop appeal to go round too. Ace.